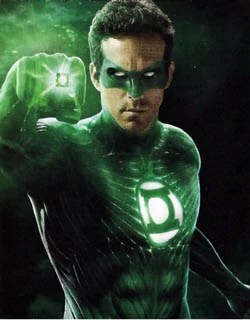 Go see the Green Lantern. You’ll love the symbolism! It’s very powerful! I thought about you when I stood up in the theater. I showed Kelly the text and she agreed that that was too much of a coincidence so we decided to go see it as soon as we could. Now, I know that this might seem like too big of a deal to make about a comic book movie, but if you think about it in the context that I am presenting it in then it may make a little more sense. Most of us, and men in particular, have a hard time admitting to fear and weakness. We have been taught that admitting weakness is the sign of a loser and even when we know we are afraid we pretend that we are not. Most of the time we pretend to not be afraid for fear of our own self image and the more noble of us do not show our fear because we don’t want the people who depend on us to worry. Like Hal Jordan (the Green Lantern), we think it is our job to not be afraid. But that is far from the truth. When studying this idea of strength being made perfect in weakness, I go back to Paul’s teachings on The Foolishness and Weakness of God. In 1 Corinthians 1:26-29, Paul teaches that God uses the foolish things of this world to shame the wise and the weak things to shame the mighty. For those who were paying attention to more than the special effects and battles scenes, you might have picked up this theme in the Green Lantern. At some point Hal Jordan explains to the Guardians and the present members of the Green Lantern Corp what it means to say, “I am only human.” For a long time I hated that saying. I thought it was the excuse of morally lazy people who just wanted to give in to their animal natures and never deal with the consequences. In recent years, I have been humbled by different circumstances to see that saying differently. The fact is, I am only human. I am weak and I am afraid. But I also am not limited to that condition. By God’s grace, even though I am afraid I can face my fears and even though I am weak I can trust in God’s strength to lift me up despite feeling down. That is the glory and the blessing of accepting that you are only human. We don’t have to be gods, but rather we can trust that if God saw fit to choose us for some purpose then he has given us what we need to fulfill that purpose. All that is required of us is faith. Those of us who look to the example of Jesus often forget that he felt afraid too. We pay no attention to his sorrowful and distressful prayer in the garden at Gethsemane when he asked God three times if it was possible for him to avoid his fate. We want our heroes to be fearless so that we can hide behind them for protection rather than taking up our own crosses and bearing them. But when Paul asked that his weakness be removed, God said, “No. My grace is sufficient for you, for My strength is made perfect in weakness.” It was weak of Hal to try and get out of being chosen to protect his area of responsibility, but in the end he admitted his weakness to those closest to him and ultimately did what he was called to do. Am I comparing a comic book movie hero to Jesus. Yes and no. What I am doing is comparing the very common human experience of being weak and afraid but having to do what we need to do anyway. One of the complaints from critics of this movie was that there was no significant bad guy in this film. But I want you to think about something for a minute. In reality, how many of us have an arch nemesis that we have to do battle with? In this movie the real enemy was soul sucking fear itself. Like Franklin Roosevelt said, fear is the only thing we have to fear. It is the shapeless formless enemy that infects us and drives us mad like it did to one of Hal’s friends. Yeah it would have been awesome to have one bad guy that we can point the finger at and blame for all the evil, but life really isn’t that neat. Fear ultimately is an internal enemy that must be overcome within before any changes can be made without. That’s what The Green Lantern had to face and in the real world that is what we all have to face. When we do we find that there is a strength that God has been perfecting within us all along. When Hal realizes that being afraid is nothing to be ashamed of he is able to confront his fears and help his planet. Do you know that all of us are in that same position? We cannot help anyone until we overcome the things that hold us back–those faceless fears, demons of the past, anxieties over the future etc. Once we do that, we find that we are filled with creative power and energy that are only limited by our imagination. This is a very good spin on the movie that I have not seen yet. Your deep thinking and thoughtfulness is right for our time. Incidentally, your presentation is perfect! I will go and see the movie soon. Thanks for taking the time to comment. I hope that more people will look beyond the surface of things. I think that with so many of us trying to distract ourselves from our inner realities, God’s got to creep in those places where we are most vulnerable. Movies like this can be a blessing in disguise. Pun intended.